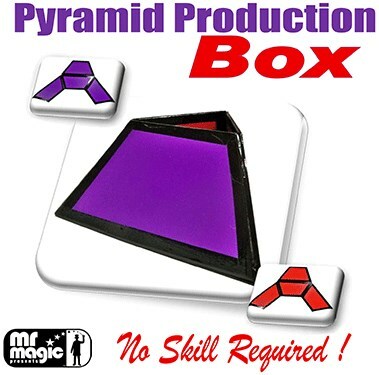 The Magician shows a Blue colored triangular box. The box looks like a pyramid. He unfolds the Box into a "V" shaped panel. It is seen that the three sides and the bottom of the Box (all in the shape of trapezium) are hinged together. He then reverses the panel. The other side of the panel (i.e. the inside of the box) is seen to be of Red color. He then reconstructs the Box and produces silks, spring flowers, canes, sponges, etc. from inside the apparently shown empty Box. This magic trick is astounding and very easy to learn!